It’s amazing the interesting things one can run across in old newspapers. 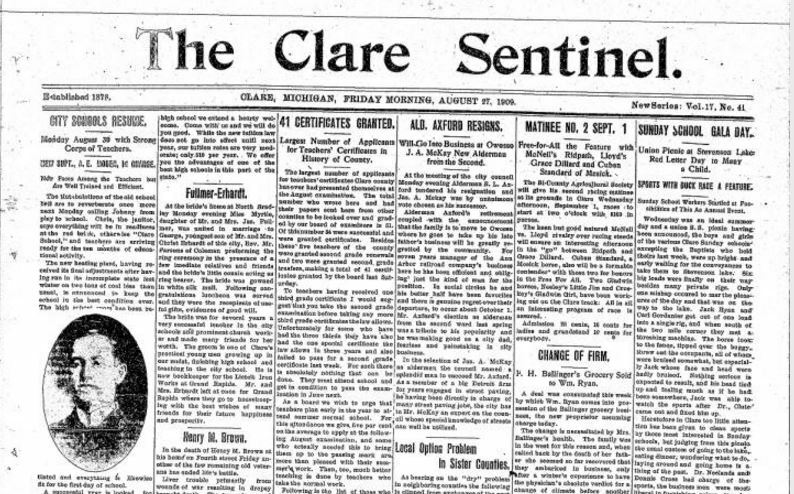 For example, I was conducting some research into Windover Lake in Clare County, Michigan and found two articles in the The Clare Sentinel looking at the county’s history during the logging era (1870-1880). One entitled “Story of Pioneer Days” had to do with the town of Meredith in the northeast corner of the county, a place that was a ghost town when the article was written. Meredith is a town I’ve covered in the past. Anyway, the articles were so interesting that I decided to reprint them here. Some of the items and people they mention are completely unfamiliar and so more research is needed. Just shows there is a lot of history in this county YET to be discovered and covered. Would that I were a novelist, is the wish that comes to this Etcher as he recounts the Rabbi’s reminiscences and reads the Sentinels’ “30 year ago” column. The scene Clare county, the subject matter the history of this locality the past 30 years. The characters good, bad and otherwise—Geo. J. Cummins fighting the ring at Farwell, the County Seat scrap, A. J. Doherty from sawdust shoveler to big politician, Jim Carr and his bawdy house at the present site of the old county poor house at Harrison, he defying the county, spending S20,000 to 830,000 and dying with his wife in a pitiable condition near Meridith. Meridith and Dodge vanished. The timber barons, the famous “highway orders” in Clare and Gladwin counties, timber stealing and appraising land, the lumber jacks at Meridith, Clare, Hatton, Farwell and Harrison. The famous Vernon funeral sermon, “You devil you rest in peace.” Joe Hudson cutting a hole in the woods— his bear scrap, the school at Leota in 1907, the famous political triumvirate. Editor Goodenough with a prison record, striving to be a man, the pine wealth denuded and rushed pass Clare a train load of logs every 15 minutes, yet with all the generous impulse, the kind heart of the people and the stalwart men who have come out of such environment— what a theme for a novel. The characters, composite perhaps, are all in the memory of the old residents, living today many of them, and only need concentrating to produce striking characters, and yet a true interpretation of development in this part of Michigan. Here was erected in a night so to speak, the busiest, most prosperous, but wildest little lumbering town in Central Michigan. It was located about sixteen miles north of Harrison and eighteen miles south of Houghton Lake. It was about forty years ago that the great pine forest was cut away to make the clearing where the town was to stand, and the first building erected was “The Meridith House,” a large hotel of which Bile Hall was proprietor. Another hotel was built called “The Corrigan,” being named for the Corrigan brothers who were trainmen on, the road which ran into Meridith at that time. Back one of these houses accommodated as high as two hundred men for dinner, averaging one hundred. Joe Black also owned a boarding house doing a good business. I will name some of the places of business that you may have a fair idea of the property of the town at that time. There were three grocery stores, Rherdon’s general store, Well’s and Stone’s general store, two hardwares, three clothing stores, one, jewelry, three meat markets (one being owned by Sweeny Bros., since living in Mt. Pleasant), two blacksmith shops, one drug store, barber shop, post office, two livery barns doing a big business, skating rink, and dance hall and four or five saloons (which of course prospered greatly). A doctor they were also fortunate enough to have for Dr. Scott was a faithful friend to all. There were a few things which there seemed to be little time for and some of these were real comfort, beauty, or any kind of religion. The town had been built for a year before there was time to stump the main street. During the three years which Meridith boomed, no church of any denomination was built. A few meetings were held in an old blacksmith shop by a traveling minister (the blacksmith being kind enough to loan his building for the services). Later Mr. Sweeny opened the doors of his home to those who wished to have church services there. Most of the working class were French and Irish. Consequently many were the hard fought battles between the two nationalities. Although every one worked hard and sometimes under great difficulties, they had their amusements as well, dancing being the foremost of these. Billy Glasscoe did the fiddling and when there was no fiddling to do Billy did nothing at all. Joe Hatfield the barber played the banjo. Often the logging train took all who wished to go out to Well’s and Stone headquarters/ a distance of about twelve miles, to dances held there. Those who remember Meridith will miss the mention of another well known but horrible name, “Jim Carr’s Place.” From here both men and women agents were sent out to hire young girls to work in lumbering town boarding houses offering large wages as an extra inducement. They were brought here, where, when they entered, a heavy door closed behind them which they could never opened again. Their parents and friends knew nothing of them thereafter, it being as if the earth had opened up and completely swallowed them. A number of blood hounds were kept and one girl was killed in trying to make her escape. One and only one did succeed in getting away and reaching friends in Harrison, and she afterward told her story. Jim Carr died in an old blacksmith shop and later his wife died deserted and alone in an old building without friends or money. One day last summer as I was driving through that part of the country I stopped at the spot where Meridith at one time stood and I thought how impossible it seemed that those waving fields of grain and green meadows were at one time a hustling prosperous town. There is but one little old building left to mark the spot, nothing else to tell us that this quiet, this lonely place had once been broken by the sound of the axe and saw cutting the large standing pine, the tramp of many hoofs, and the tread of busy feet.